This collapsible drinking cup is designed so that you’ll actually skip the throw-away coffee cups. 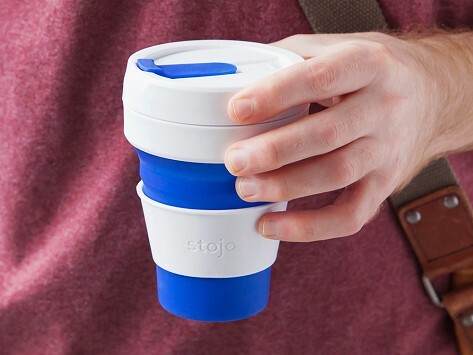 Stojo folds down to a mere two inches, and—unlike traditional reusable cups—easily fits into coat pockets or bags. The hard plastic lid is leak-proof, and the heat sleeve protects your hand, adds stability to the flexible design, and stores neatly into the bottom of the cup when you’re not using it. Fluid Capacity: 12 fl. oz. or 16 fl. oz. Weight: 12 oz. : 0.32 lb. ; 16 oz. : 0.51 lb. Nice to collapse and put in your purse or briefcase. Great concept. Awesome product! But only 12oz. Please make a 16oz!! When it first arrived I was a bit hesitant as I wasn't quite sure it was going to work. During my first usage I quickly learned to not fill it all the way to the top, but after that, it works great. Every barista or coffee shop I have taken it too is totally enthralled with the idea. I rinse it out after my drink is gone and drop it in my bag. It hasn't leaked and looks like it will stand the test of time. It has already done exactly what I wanted it to do which was to offer me an option to not carry my large travel mug and always have something with me. We all want to do the right thing and drink from a reusable coffee cup. But most of us either forget to bring them along or don’t want the hassle of carrying a clunky mug or reusable bottle. 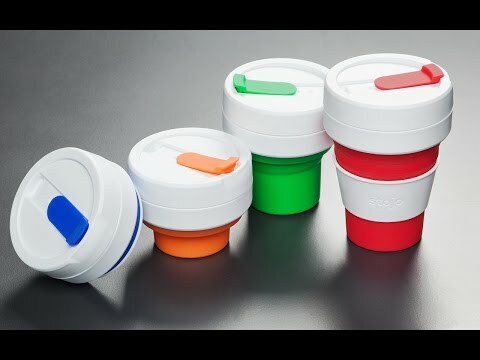 Stojo is a collapsible drinking cup made mostly of silicone. It folds down fast into a two-inch-thick disc that fits in your jacket pocket or bag. A hard plastic heat sleeve adds stability while insulating your hand. And the plastic lid is spill-proof, even when the cup is compacted. Co-Founders Jurrien Swarts, Ben Melinger, and Alex Abrams were talking (over coffee, fittingly enough) about how much waste to-go cups generate. But bulky travel mugs didn’t work well with their busy, urban lives. They created a reusable travel cup that’s easy to carry and store, so you’ll be inspired to cut down on paper cups. Every time you use it, that’s one less paper cup that gets thrown away.